I am a big fan of Shonda Rhimes, the executive producer and head writer of Grey’s Anatomy and Scandal. I watch those shows for the brilliant writing. On vacation, I read her Year of Yes, a manifesto of sorts for all women to embrace their magnificence. Like me, Shonda’s playing field for her magnificence is work. Sometimes we scale our biggest mountains at work, and expect home to be the place that nourishes us for the next big climb. And other times, work provides for us to scale the next peak at home or in our soul. A caring executive assistant advised me almost twenty years ago, “We are supposed to work to live. We don’t live to work.” At the time, I viscerally disagreed with her. I’m still not sure that I agree with her now. Work has always been an integral part of my being, a place that gives me identity, a playing field to exercise my mind, my creativity, and to catch the ideas that find me. It’s where I’m planted to grow and to bloom. While on an extended vacation – three wonderful weeks to travel, celebrate, and indulge in new adventures with my husband, son and daughter, I am planted in the space of my family to grow. I am inspired by my son’s ambitious goals for 2016: to become proficient in two foreign languages, to run an Iron Man, and to get scuba certified. He’s going for the extraordinary. My own goals are much more modest: to ensure that every interaction I have leaves the other person feeling positive and better about themselves, to finish writing my second and third book projects, and to work with great people in organizations that care about a higher purpose. Modest, and not so ordinary. 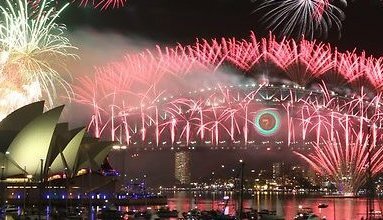 Same as my modest goal of taking my family to Sydney to celebrate New Year’s Eve and our son’s birthday. A modest goal that turned out to be one of the most extraordinary, humbling, and inspiring experiences of my life. The Australians know how to celebrate with ingenuity, style, and the biggest heart. Those fireworks –the grandest and most breathtaking I’ve ever seen -- expressed what we know to be true, but are afraid to say out loud: We are magnificent, and we must be willing to show our magnificence in everything we do. This is the message that Shonda Rhimes struggled to discover in her year of yes. This is the secret to living a creative life, so that we can say yes to our own magnificence each and every day. When we learn to do that, the best ideas find us, and all we have to do is be. Be open, be willing, and grab on.